I’m more of a sweet potato soup-gal, but this soup knocked my socks off. I turn to sweet potato as the basis for creamy hearty soup time and time again and never stop to think about sweet potato’s more pear-shaped cousin, butternut squash. And how could I forget about a fellow pear-shaped gal? That’s the funny thing about complacency. You’re okay with how you’ve been doing things for a while, then all of a sudden, you’re not. You’re not okay with your patterns of behavior and you realize that you’ve been complacent, which is not the same as happy. I’ve been tearing through dessert once or even twice a day with no regard for my sugar intake. It’s left me feeling a bit cranky, a bit dissatisfied. I feel soft and spongy. Yes, I feel spongy, thank you very much. I’m squishy with nothing substantial on the inside. How’s that for painting a picture? And then my mom texted me yesterday morning wanting to know if my sugar detox diet plan was on my blog. Thanks for smacking me in the back of the head, Mom. What I’m in the need of is a good detox from sugar. If you remember my last sugar detox, it’s more of a plan for elimination of added sugars and some fruit restrictions, than an actual diet or prescribed way of eating. In reality, I should be eating this way 80-90% of the time. I felt great eating less sugar and concentrating on whole foods last June when I documented my eating. It’s high time I got back to this way of eating and concentrate on making it a priority in my everyday eating. This soup would fit well into my plan. 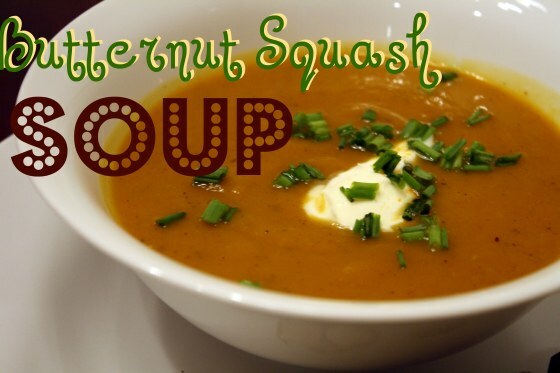 Butternut Squash is a starchy vegetable and has 4 grams of naturally occurring sugar. For comparison’s sake, a large apple has about 23 grams of sugar. This soup is hearty, velvety, earthy, and absolutely delicious. It just gets better with time and freezes beautifully if you don’t eat it all up in a week, like I did. Did I mention it’s incredibly healthy? Well, it is, in case you were wondering. 1. Cut butternut squash in quarters, remove seeds, and bake on 400 degrees until flesh is tender (45 minutes to 1 hour). 2. Heat oil in a large skillet and add onion. Cook onion until soft and just beginning to caramelize, turning a light brown. 3. Heat broth on a burner turned to medium high heat. Scoop butternut squash out of the skin and into the broth. Add onion as well. 4. Add all spices and stir to combine. Cook an additional 15-20 minutes. 5. 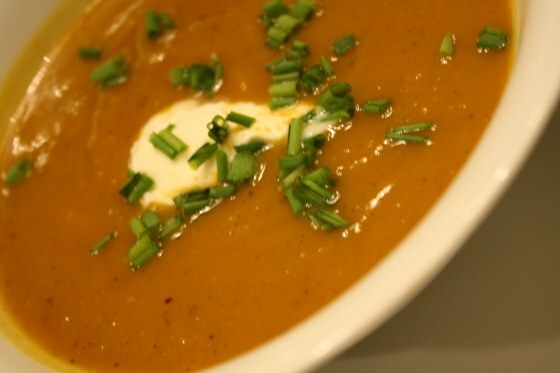 Blend soup using an immersion blender or by transferring soup to a blender or food processor. 6. Spoon into bowls and serve. Do you know what goes perfectly with this soup? 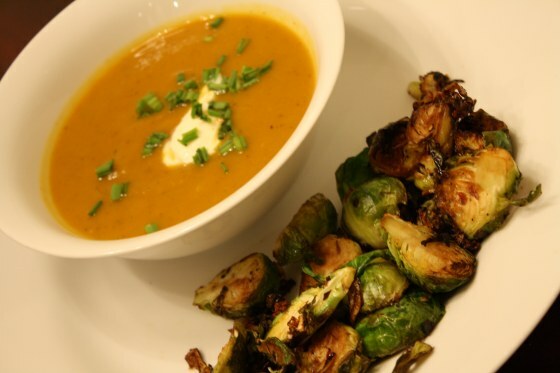 Caramelized maple brussel sprouts, that’s what! Although I’ve made this recipe at least ten times, I’ve never recorded it here in an easy-to-use recipe format. It’s about time, right? I’ve also made a few tweaks here and there from the first time I’ve made these. This is the dish that (I’ve been told) has turned brussel sprouts nay-sayers into brussel sprout lovers or at least, has resulted in some “hey, that’s pretty good!” responses. I’m just glad my mom likes them. Coming from someone who used to roll her brussel sprouts in mash potatoes and swallow them whole, a few kind words about my recipe mean the world to me. 1. Heat oil in a large skillet and add brussel sprouts. 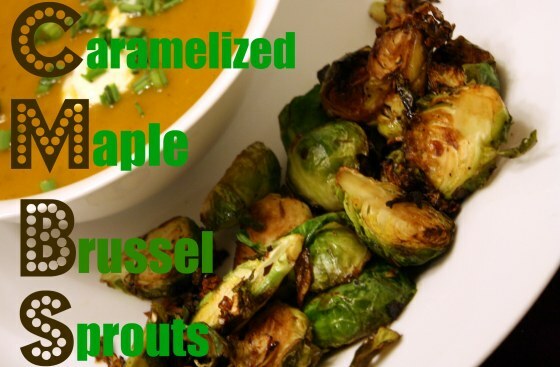 Cook for about five minutes, stirring periodically and flipping the brussel sprouts over so each side is browned. 2. Drizzle maple syrup and vinegar over the skillet’s contents. Sprinkle with pepper flakes and salt. 3. 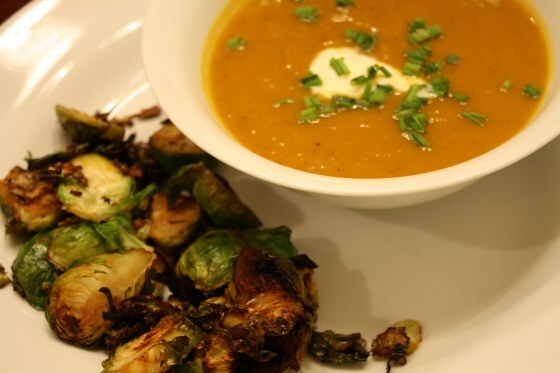 Allow to cook an additional 3-5 minutes, stirring periodically so that brussel sprouts are a a deep brown on both sides. 4. Plate and serve immediately. *Brad and I love these so we fill half our plate with them. If serving multiple sides, where a smaller portion is served, this recipe will serve about six people. Something needs to be done and I think revisiting my sugar detox plan is the way to go. The question is: how do I share this? a. I want to see a week’s worth of sugar detoxing eats. b. I want to see sugar detoxing friendly recipes. c. I want to read your general thoughts and strategies on sugar detoxifying. d. I care nothing about sugar detoxing. I rely on TJ’s for my butternut squash soup, but I really should start making my own… Soup is one of those things I never think of making and usually don’t feature it as a main dish- gotta switch up my mentality! Do you eat the kind in the box? I absolutely love their canned soups, especially split pea, but the amount of sodium is horrifying. Can I choose both a and b? I like recipes, and I also like to see a more macro scale of a meal plan that I am less familiar with, such as sugar detoxing. Also, thanks for the reminder that I too have a butternut squash that needs to get used soon! Butternut squash always reminds me of that Friends episode where everyone makes fun of Ross for saying squtternut bash. Have you seen that one? LOL. Although I’m pretty sure I’ve seen all Friends episodes at least 10 times, I don’t remember that one. How is that possible? I think it was a Thanksgiving episode, but I can’t remember for sure! I still <3 Friends! I did a sugar detox earlier this year and it was so, so, so hard. I did it for two weeks and lost 5 or 6 pounds though, so it made it pretty obvious to me that I rely on sugar far too much. I slowly went back and then fully went back so the pounds came back, but as I move into marathon training and maybe baby making I need to be more conscientious of my sugar intake for sure. Would love to see your thoughts and tips. Did you blog about it? I love reading other people’s experiences with things like this. i choose b and c! both recipes sound so perfect for dinner on a freezing cold snowy night. yum. I’m starting the sugar detox myself. I try my best to not eat anything that has more than 5 grams of sugar per serving – so it’s not complete detox but a BIG difference from what I’m doing now! I would love to hear all about your detox. Great recipes. I made both and my husband loved them. Do you by any chance know the calories, protein, fat. sodium of this soup recipe. He actually has to track all his food right now for a nutritionist and I was looking for the information. Thanks for sharing. I am enjoying your blog. That’s awesome Laura! So glad you and your husband liked the recipe. I found the nutrition stats easily by using this handy website http://caloriecount.about.com/cc/recipe_analysis.php. I’m guessing there are 4-5 cups in squash in a medium butternut squash. The calories are surprisingly low! That site is a wonderful resource for recipes without nutrition stats. Thanks Kelly. This is a great site and will help me a lot. Have a great day. PS – I’m eating the last of the soup for lunch today. YUM!